Owner's health forces sale after RECENT $50K+ IN UPGRADES! See full specs for details on the upgrades.Very nice cruising or live aboard trawler with a much better layout than a Grand Banks 42 or similar. The galley down layout is great for cruising as well as makes a fantastic and roomy live aboard. Hydraulic stern thruster aids in docking to compliment the efficient single engine design.Gorgeous teak interior is in extremely good condition.Owner Financing is Available! United Yacht Sales New Jersey would love to guide you through a personal showing of this 41' Present Yachts Trunk Trawler 1981. 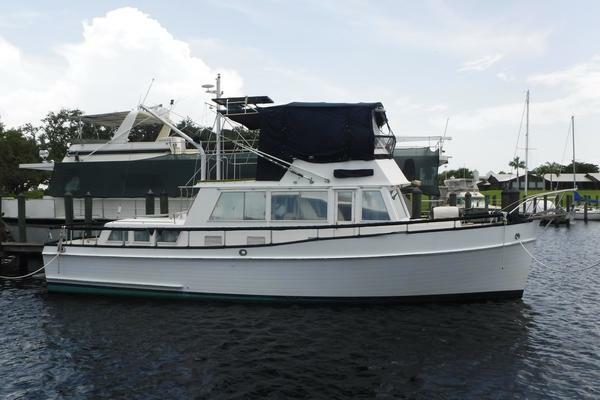 This yacht for sale is located in Ft. Lauderdale, Florida and priced at $59,900. For a showing please contact us by filling out the form on this page and we will get back to you shortly! Overview: The all teak interior is in exceptional condition overall for her vintage and the joinery work is simply gorgeous.The master stateroom is aft and features a queen centerline berth, en-suite head with sink, vanity, shower and tub. The storage space is extensive, from the built in drawers to the expansive hanging lockers. Great for living aboard or extended cruising alike.The salon is bright and airy, and features 360 degree visibility. There is a custom built settee in the salon with even more built in storage. A flip up teak table adjoins to galley bulkhead for convenience.The galley down features decent cabinet space, hot/cold pressure water sink, a full size refrigerator, 3 burner electric stove top and microwave.The guest head is opposite the galley.Forward is the guest cabin with double lower berth and upper single. Features include hanging locker, deck hatch, and opening port holes.